My apologies - after posting I found out this morning from the masjid that today is the 8th not the 9th of Muharram. The 9th will be tomorrow on the 12th of November. I usually plan to fast on this day, but often forget or fail to wake up for the pre-dawn meal and then find it too difficult to fast (although the days are currently very short). 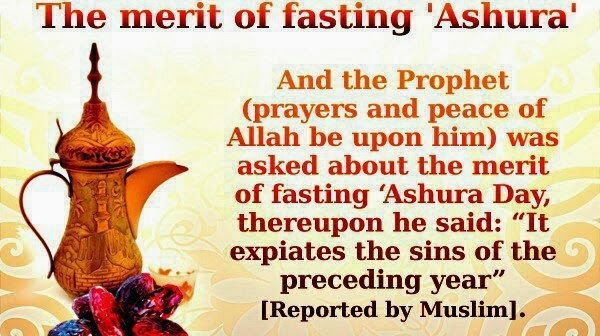 So this post is partially a reminder to me and also to encourage anyone who may have forgotten or not realised that Ashura is approaching. 2. The ship of Prophet Nuh (Noah) (Allah’s blessing be upon him) came to rest on a mountain called Al-Judi. 3. Prophet Ibrahim (Abraham) (Allah’s blessings be upon him) was born on this day. 4. He got the title Khalil-ullah (friend of Allah) on this day. 5. The fire in which Prophet Ibrahim (Allah’s blessings be upon him) was thrown by the king Namrud become cool and means of safety for Prophet Ibrahim, by the order of Allah. 6. Allah delivered Prophet Ayub (Job) (Allah’s blessings be upon him) from distress and he was restored to prosperity. 7. By the Grace of Allah, Prophet Yunas (Jonah) (Allah’s blessings be upon him), after being swallowed by a huge fish (whale) for forty days, was casted out on the shore. 8. Prophet Mussa (Moses) (Allah’s blessings be upon him) got victory over Pharaoh. 9. Prophet Suleman (Solomon) (Allah’s blessings be upon him) was made a king to rule over mankind, Jins, Animals and the air. 10. Prophet Idris (Enoch) (Allah’s blessings be upon him) and Prophet Issa (Jesus) (Allah’s blessings be upon him) were lifted up alive. 11. Imam Hussain (Allah be pleased with him), the grandson of our beloved Prophet, got martyred at Karbala in Iraq. If you found this useful please remember me and my family in your duas. This is certainly useful!! Hope your fast goes well!